Hundreds gathered at the Star City Museum for a momentous occasion, that day's Martian Artifacts Exhibit. First Citizen Green Arrow agreed to accept Martian Manhunter's gift to the city in a public ceremony. J'Onn J'Onzz announced, "Can't wait for the Flash any longer! We'll have to start without him!" The Scarlet Speedster ran in, excusing himself as having had to search for a parking space that could accommodate the Delta Probe One. Green Arrow was nonplussed, as he prepared to "put the Manhunter's Martian Power-Jewel on display." 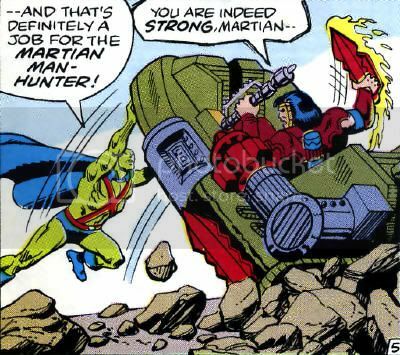 The Manhunter hushed his fellow heroes, as Martian Hearing had detected something that would eventually crash through the museum wall-- Kalibak in his Boulder Bomber! "I claim the jewel in the name of Darkseid, master of Apokolips!" Flash tried to talk Manhunter into waiting, but "No time! That maniac has to be stopped before he destroys the entire museum-- and that's definitely a job for the Martian Manhunter!" As the Alien Atlas lifted the Boulder Bomber nearly off its treds, Kalibak taunted "You are indeed strong, Martian... but strength alone means nothing against the power of my Stun-Spears!" 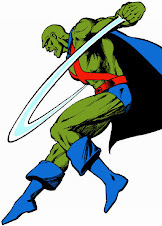 Sure enough, "Kalibak's spear is ablaze with unearthly fire-- and fire is a Martian's greatest weakness-- G-getting dizzy... can't stand... H-help me..."
His friend on his knees, Oliver Queen proclaimed "The Manhunter's down! Gotta do something!" An Extinguisher-Arrow fired was intercepted by Kalibak's vehicle. Meanwhile, the Flash had run to his own ship, and collided with that of Darkseid's son. However, the Delta Probe One ended up buried in rubble, leaving Green Arrow to fire the dismounted Kalibak's own Beta-Club at his head, knocking him out. After Kalibak had been placed in the probe's "Prisoner-Pod," the Martian considered "I'd call it poetic justice, archer!" Like the jewel, Kalibak would end up on display-- behind bars! 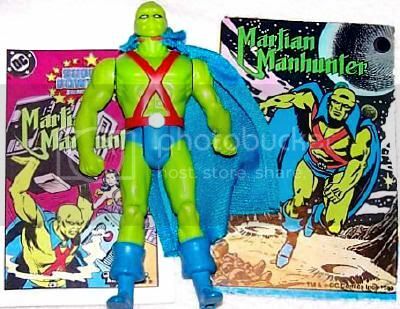 I had hoped to go into great detail about my love for the Martian Manhunter action figure, but I used up my childhood stories a year ago, and much of the technical details of the line were discussed with the carded figure. Instead, I'll let the pictures (provided by the lovely Pekita Trotamundos) do most of the talking. I'm quite sentimental about the "pie slices" icon on his belt, for no reason I can defend. If you squeezed the figure's thighs together, his left arm would swing up in a "Power Action Martian Punch," while his left arm swung backwards to really build up steam. The detail and functionality of those arms were incredible in their time. By comparison, Superman was the biggest sissy with his two bent elbows always at his midsection. Please forgive the many nicks, paint smears, and so on. I bought this figure second hand, and stored it in an uncomfortably tight drum with hordes of other mistreated figures. As I've noted elsewhere, my original figure lost his cape about as quickly as I misplaced most accessories as a kid. I kept him from 1985/86-1989, when I loaned him to my brother. He disappeared forever at a juvie camp. I liked the definition and mood in these shadowy pictures, plus you can clearly see the punching pivot mechanism in the right shoulder here. 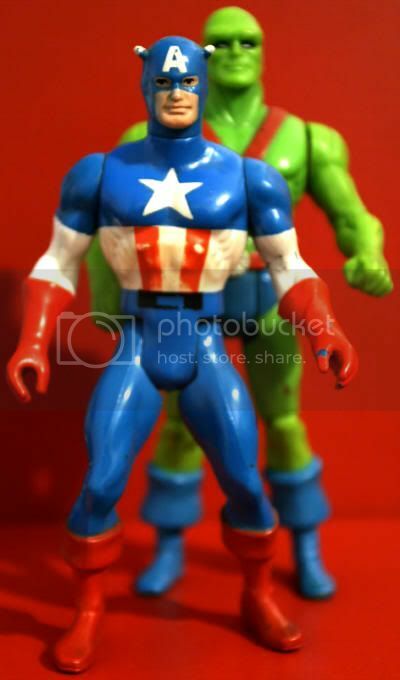 Pictured here is my second Secret Wars Captain America figure, as the original vanished into the woods with J'Onn J'Onzz twenty years ago. I wanted to show the difference in scale between the Secret Wars and Super Powers figures, plus these are the only examples from each line I still own, as they're personal favorite heroes. Both were purchased off eBay, though the Canadian I bought Manhunter from gave me a million excuses for it taking nearly two months to get the figure to me. I bought Cap American with no fuss, though I was burned enough in general at the time to avoid the auction site whenever possible to this day. Oh, and I'm totally wearing my new Secret Wars t-shirt I bought for $7.50 at Target as I type this. All hail Mike Zeck! My poor girl took something like thirty head shots, and this was the best in my estimation. She doesn't shoot micro often enough to have the proper lens for this kind of job. I also chopped and altered all these shots all to heck. I love that gentle smile, the cheekbones, and of course the brow. 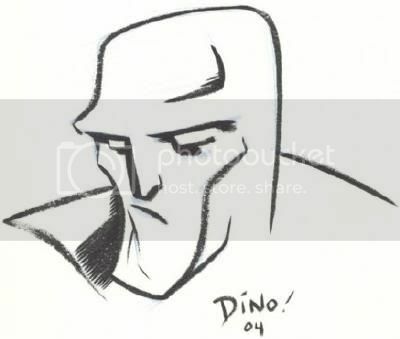 It occurs to me I've rarely seen the comic book J'Onn with white eyes, and never wearing eyeliner. Those cauliflower ears are pretty upsetting, as well. Still, this will always be the Alien Atlas of my heart. In 1964, the Hasbro toy company released the first "action figure" line, G.I. Joe. They were roughly a foot tall, which we would generally consider dolls today. They featured removable cloth clothing and various accessories, essentially a masculine counterpart to fashion dolls. I believe the first super-hero dolls of this sort were part of the Captain Action line of 1966 from Ideal Toys Corporation. 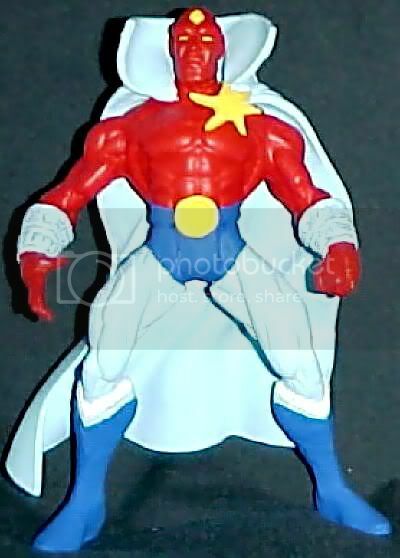 However, rather than full-fledged figures, the Captain Action character would change into accessories/costumes which could turn him into Aquaman, Batman, Captain America, Spider-Man, Superman and many more. His sidekick Action Boy could himself "become" Aqualad, Robin or Superboy. 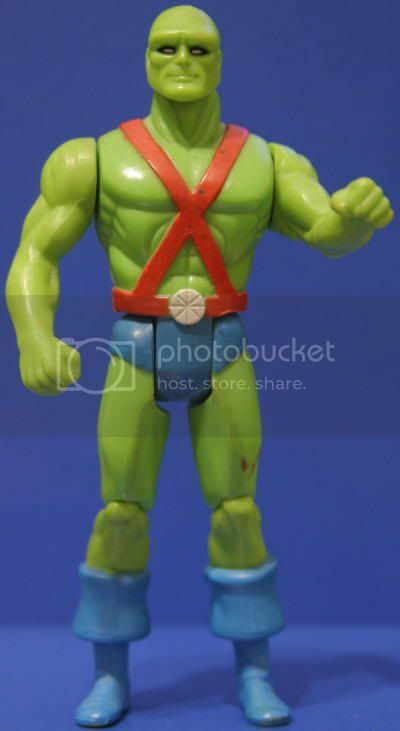 This action figure format popped up throughout the 1970s in various forms, but faded from popularity over time. I'll confess to owning an Indiana Jones figure from 1981, and piecing together scale dolls around my hero. These included a Gene "The Demon" Simmons KISS doll as main antagonist, numerous Barbie knock-offs as girlfriends/damsels-in-distress, and Ken as Indy's sissy-boy sidekick. I believe I had a Six Million Dollar Man Bigfoot at some point as well. My grandmother asked the doctor if they made me queer, but the man said they would help my social skills. My stepfather disagreed, and quietly gave all my dolls away without consent. In 1972, the Mego Corporation began producing the "World's Greatest Superheroes!" This was the only time DC and Marvel action figures were part of the same standardized line, standing about eight inches tall with removable fabric costumes. 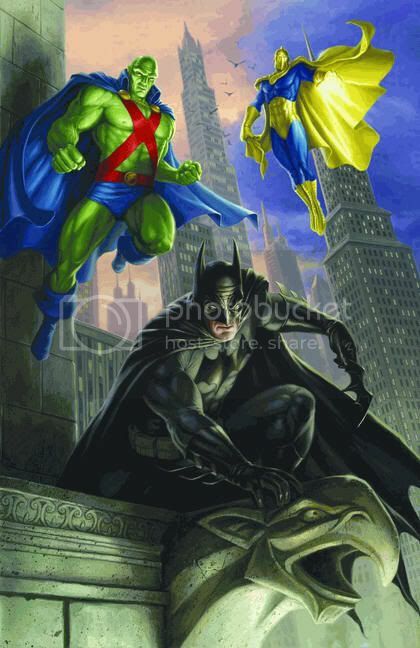 Classic JLA heroes like Superman, Batman, Wonder Woman and Aquaman stood beside Marvel greats like Spider-Man, the Incredible Hulk, Cap and the Fantastic Four. The line was very popular, lasting until 1983. In the meantime, the Kenner Star Wars action figures revolutionized the industry, offering a much wider selection of characters at a cheaper price. They averaged 3 3/4" in height, with outfits a part of the figural sculpt, and a greater emphasis on weapons and other accessories. The smaller size also allowed for the construction of vehicles and playsets. For myself, the heyday of Mego was a tad before my time, though I played with my friends'. On the other hand, I was on to Star Wars from jump. In 1976, Mego had tested the waters for the 3 3/4" format with their Comic Action Heroes, which had modest sales. They were truly hideous, crouching monstrosities, and I speak from the experience of having owned (yet rarely enjoyed playing with) about half the line. Hey, I grew up ghetto, and they retailed for less than a buck a piece, so you took what you could get. Anyway, the line was revamped in 1979 as the Mego Pocket Heroes, which were closer to resembling homo sapiens, but cost half again as much as the previous line. Competition grew increasingly fierce heading into the 1980s. 1981 saw the release of Mattel's Masters of the Universe, capitalizing on the short-lived barbarian trend and popularizing a new 6" high format. In 1982, the same year Hasbro offered its heavily articulated and hugely successful 3 3/4" revamp of G.I. Joe, Mego filed for bankruptcy. This left super-heroes up for grabs, though the demise of Mego saw one big happy family separated by a custody dispute. Mattel pursued the DC Comics license, but lost out to Kenner. They then talked to second choice Marvel Comics, but only if their editor-in-chief Jim Shooter agreed to release a comic book tie-in to help promote the line. This synergy had worked spectacularly with G.I. Joe: A Real American Hero, which snowballed from toy-to-comic-to-animated commercial for both-to-a long running cartoon series (plus sustained toy and comic sales of well over a decade.) Shooter was hot to keep up with DC on the action figure front, and cashed some healthy royalty checks by writing the 12-issue Marvel Super Heroes Secret Wars comic himself. Shooter also wrote the sequel, which involved Peter Parker teaching an omnipotent being to poop, and other things best left unspoken. 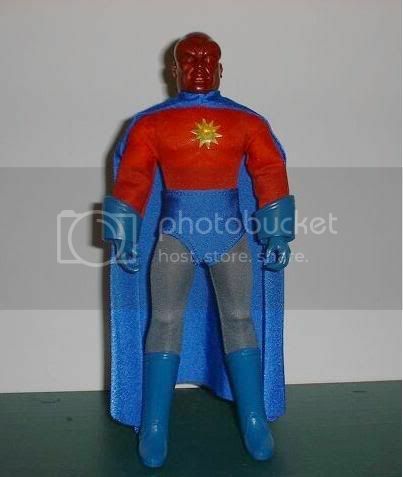 The Super Powers Collection debuted in 1984, earning its name through hidden mechanisms within each figure that allowed them to display a triggered action. They offered a Flash whose legs could "sprint," a Plastic Man whose head would pop-up to reveal an elongated neck, and so on. They averaged a full inch taller than their contemporaneous figures (excepting He-Man and company,) which made them either more dynamic or irritatingly over-sized, depending on who you ask. Aside from cloth capes and other costume elements, these figures were fairly light on accessories, focusing on their action features and a 16-page mini-comic adventure for their characters. The first wave of figures featured all but one founding Justice League member plus Super Friends Robin and Hawkman and several big name villains. This wave was supported by a rebranding of the Super Friends cartoon and a five issue comic book mini-series drawn by comics' legend Jack Kirby. Marvel Super Heroes Secret Wars also bowed in 1984, but were comparatively underwhelming. They stood a half inch shorter than Super Powers, were lesser quality sculpts, had poor paint decoration, featured less articulation, and cheap lenticular shields into which could be inserted paper motion images. Only four heroes were available (Cap, Spidey, Iron Man, and the first Wolverine ever,) and an equal number of villains, bearing the slightest of accessories. Aside from ongoing but mostly unrelated Spidey and Hulk cartoons, Secret Wars was mostly on its own in TV land, in the form of commercial spots. However, the comic book was heavily promoted, not just as a tie-in, but as Marvel's answer to Crisis On Infinite Earths. Hardly true, but between hype and art by Mike Zeck, it sold gangbusters. The Super Powers Collection did well, and a second wave of figures was released in 1985. For the first time ever, Martian Manhunter, Red Tornado, Firestorm, Dr. Fate, and the Fourth World characters were captured in plastic. Jack Kirby returned for a new 6-issue mini-series, and received some of the only royalties of his career through his work on the line. A new season of cartoons, The Super Powers Team: Galactic Guardians, reflected the additions. Marvel Super Heroes Secret Wars fared worse, offering a second wave of repaints, with only two new heroes and villains made available. A meandering nine issue comic book mini-series sequel bombed, while Spider-Man and His Amazing Friends was winding down in reruns on NBC. The third and final wave of the Super Powers Collection under performed in 1986. It mostly consisted of leftovers and characters created in-house by Kenner as a medium for new action features. 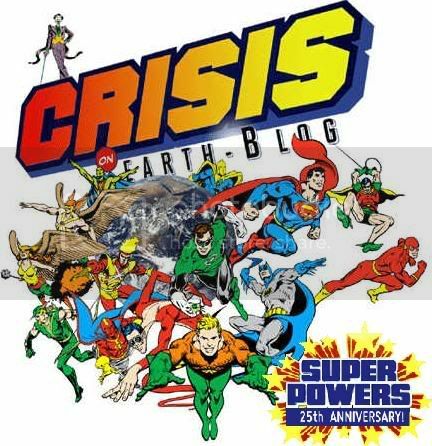 DC released their ultimate five issues mini-series with art by Carmine Infantino, while Super Friends/Super Powers left the air after thirteen years. In the end, 33 primary figures were produced, a number of variations, plentiful bootlegs, nine vehicles, and a playset. 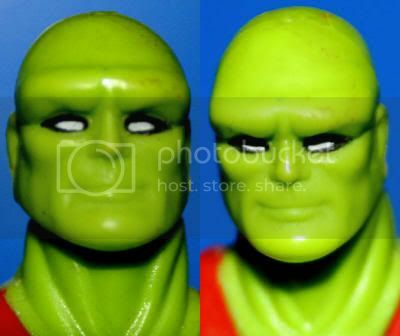 Kenner's molds also popped up in use for other lines into the early 1990s. Kenner was faced with financial woes after being spun-off from General Mills in 1985 that crippled the company, including the declining sales of both Super Powers and Star Wars. Kenner was eventually absorbed by Hasbro. Marvel Super Heroes Secret Wars dumped a third "wave" of three figures into the European market. 15 primary figures were produced, variations were offered, 7 vehicles, and a playset. Mattel continues to this day, though as much as 80% of their sales comes from their Barbie line. 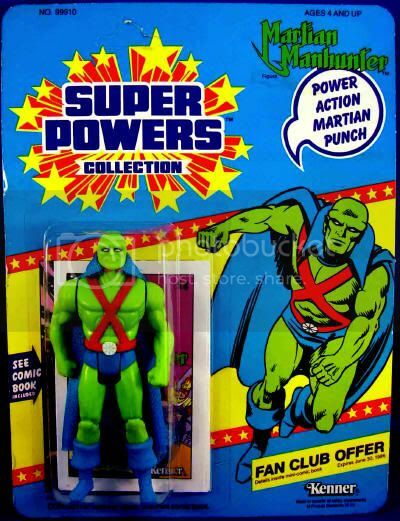 The Martian Manhunter toy came with a cloth cape, the mini-comic Super Powers Collection 14, and a mechanized "Power Action Martian Punch." The figure shipped in a plastic blister case attached to cardboard. There are several variations on the card, with some slimmer than others. The front offered two versions of a pin-up of the main character, one a detail, the other with a space scene backdrop. 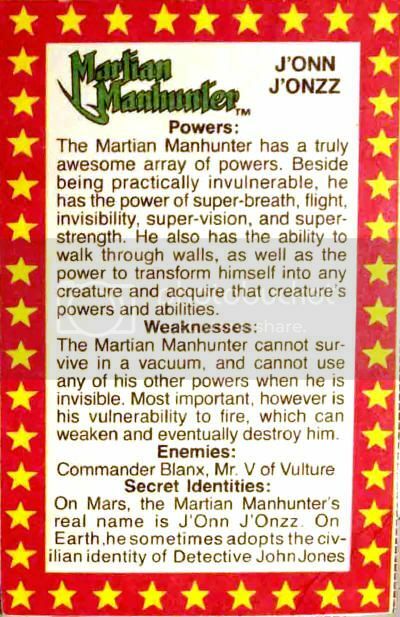 The back of the card advertised other figures in the line, special offers, and a text piece detailing who exactly the Martian Manhunter was. If you cut along dotted edges, the pin-up and descriptive text could be turned into a "bio card" and saved. I was fond of both lines growing up, but generally preferred the more militaristic toys like G.I. Joe and its countless knock-offs. I think this was because I was so familiar with the super-heroes, that I could never make them "my" characters. I would instead take an obscure Cobra villain or American Defense nobody and turn them into characters whose destinies I could control. I also loved the greater degree of articulation and accessories outside the super-hero lines. I suspect this played into the Toy Biz renaissance of the 1990s, which while retaining the slightly larger figure size, offered much greater playability and diversity than Mattel and Kenner's combined offerings in the super-hero genre. Still, there's a lot to love about Super Powers and Secret Wars, especially my beloved Martian Manhunter action figure, so we're happy to celebrate the quarter-century anniversaries of both. 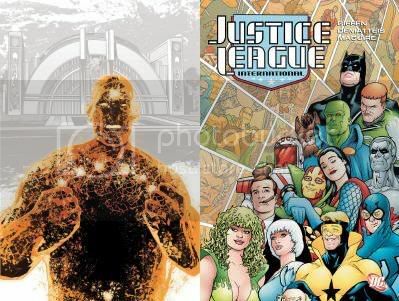 For more on the Super Powers Collection, visit Jason Geyter's indispensable Super Powers Archive, as well as Mike Mensinger's outstanding Hall of Justice Super Powers site. Fans of Marvel Super Heroes Secret Wars should visit Steven Moreno's invaluable Secret Wars Archive, as well as The Mattel Secret Wars Archive and The Ultimate Guide to Marvel Super Heroes Secret Wars. It's the night the lights went out in Georgia-- and Tokyo-- and pretty much the rest of the world. All that electricity had been drained away to the remote castle that hosted the Power Pod of the energy vampire Mantis, a disciple of Darkseid. "It's a proud day, Martian Manhunter." "The first moon flight in years, Aquaman." "We are privileged to observe its launch," added the usurper himself, Red Tornado. Manhunter assured, "The beam is coming from the east!" Aquaman spotted an island that had appeared just overnight. "And, as the awesome android, the king of the sea, and the alien manhunter speed forward," they were caught on Mantis' security camera. "Company's coming, eh? Very well, let them. One of them is a machine... and I can steal the power from all machines..."
Red Tornado and Martian Manhunter then smashed through the wall, only to turn on one another. "Great Scott! Red's attacking me! He really is controlled by Mantis! Fortunately, I can control my density... and let Tornado's fist pass harmlessly through me." Meanwhile, underneath Mantis' island, Aquaman called on three whales to "ATTACK!!" Mantis emitted a devastating blast. "Manhunter, your weakness is fire. Nothing can save you. And once I have taken away your very life... you shall know why Mantis is called the energy vampire!" However, the entire castle quaked under Aquaman's assault. 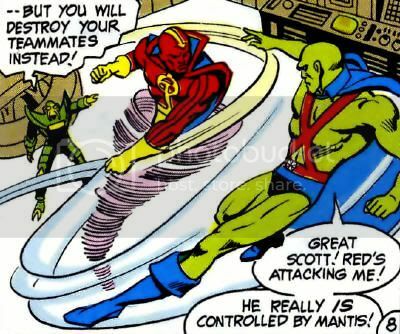 Martian Manhunter was on his feet and grinning when he saw what Red Tornado was up to. "Mantis, while you battled the Manhunter, you lost control over me! My Tornado Blast will destroy your power grid!" Having fallen out of grace, the energy vampire was returned to Apokolips involuntarily. "Mantis is disappearing... I guess you can say Darkseid's scheme just ran out of power!" Ugh... this was probably the stiffest, most generic SP comic of them all. The writer couldn't even work in a "Sovereign of the Seven Seas" or an "Alien Atlas?" The characterization seemed to come off the back of the toy packaging, so no wonder it was cardboard. I'm glad to see Aquaman and Martian Manhunter partnered up, but of course, most of the adventure was spent with the usurper, Red Tornado. At least I can take some solace in a likely Reddie defeat off panel, since Mantis had to step in. The art was also bland in this one, but what I found interesting was repeated hints of a young Norm Breyfogle (though there's no credits to be sure.) The art was drowning in heavy inks and potentially redrawn faces, though. 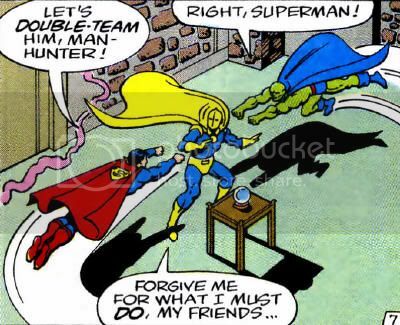 Fate's crystal orb detected the impending arrival of "My friends Superman and the Martian Manhunter! I shall enjoy visiting with them!" "This is the place, Martian Manhunter!" "Right, Superman! Won't Dr. Fate be surprised!" A sorcerous protective force field would have repelled enemies, but allowed the Doctor's friends entry-- to his peril! After Fate showed the duo a 3,000 year old artifact dating back to the Egyptian dynasty of Ramses the Seventh, Superman socked him and stole it. Manhunter demanded of his partner as he grasped mystical items covetously, "Hurry! Gather as many as you can for the master!" As the misguided heroes lunged at Fate from opposite sides, the Doctor moaned, "Forgive me for what I must do, my friends..." Fate flew up high and allowed the manipulated heroes to slam into one another. Dr. Fate then used his powers to free the mind of the Man of Steel. The Manhunter from Mars observed, "You no longer serve great Darkseid... so you too must fall!" Kal-El thought, "Got to weaken the Martian Manhunter so Fate can free his mind, too! I'll use my heat vision to set that parchment on fire!" Before dropping to his knees, Manhunter cried "NO!" Way to preserve history, right? Doctor Fate congratulated "Quick thinking, Superman! Fire is the Martian Manhunter's one weakness!" The Doctor them magically beseeched "Rise, Martian Manhunter! Your mind is your own!" His thoughts restored, Manhunter learned, "We were compelled to fight you? I'm sorry, Dr. Fate!" All was forgiven, except by Darkseid, who swore there would be a next time. It's time once again for another blog crossover masterminded by The Irredeemable Shag! The subject this time is the 25th anniversary of the release of Kenner's line of DC Comics action figures, the Super Powers Collection. This multi-blog event will be different from those past, however, as the manner in which the topic is addressed has been left up to each individual blogger. Further, several bloggers have decided to stretch their coverage over a string of posts/days, so just keep your eyes peeled for updated links and the above banner. Scans of every mini-comic appearance by the Sea King, plus a line overview, creator credits, and various other merchandise. The Penguin toy and comics. The Joker toy & comics. Batman, Robin and Riddler toys, comics and vehicles. Extensive commentary on the Flash mini-comic. Coverage and anecdotes about the Flash action figure. Classic Covers: Super Powers #2. Complete scans and commentary on the Green Arrow mini-comic. 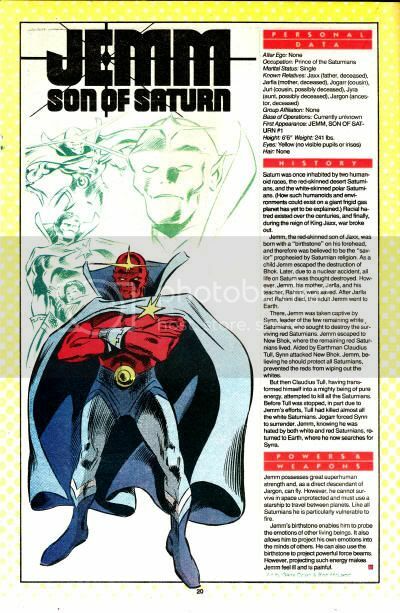 Red Tornado mini-comic scans and commentary. 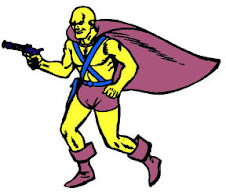 The Nuclear Man in comics and figures. Enormously comprehensive coverage of SP Superman-related items, including large scans of file card art! The Legion Omnicom: A look at the 3rd wave Tyr action figure. Love Dat Joker: Extensive commentary on the Clown Prince of Crime's role in the set, including figure photos and complete scans of his appearances from the Batman, Green Lantern, and his eponymous mini-comics. ...nurgh...: Critical reviews of every mini-comic, starting with #1-8, then #9-16, and finally #17-23. Dr. Fate and Blue Devil mini-comics and toys. Follow-up crossover coverage and supporting blogs links. Speed Force: An overview, unproduced Flash figures, and memories. Secret Wars of the Super Powers: My personal anecdotes about exposure to the line. 1985 Grenadier Models Justice League of America & Adversaries Miniature: Not technically Super Powers, but contemporaneous and featuring the same characters and art. Visit the artist's blog, Brian Quinn Illustrator, for more. 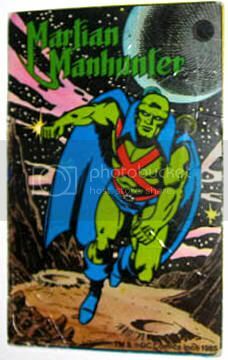 How's this for mind-blowing: a board game prominently featuring the Martian Manhunter from the Silver Age? Still sane? There's another two besides! We'll look at Wonder Woman's first. Besides offering a J'onn J'onzz headshot on the cover, it's repeated on a series of cards used in the game. The Manhunter from Mars (in red boots) takes up nearly a quarter of the game board fighting a pink alien/robot at the starting line. Very nice! I wish I knew more about the gameplay now! 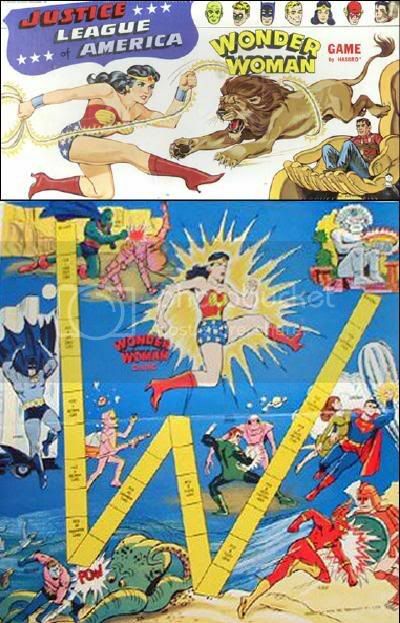 For more and larger pictures, visit the site I swiped them from, The Ultimate Wonder Woman Collector's Guide. Written by Jack Miller, Joe Samachson & Edmond Hamilton; Art by Joe Certa, Lew Schwartz & Charlie Paris. While attempting to communicate with alien life, Dr. Erdel's strange experiment had an unexpected side effect, materializing a living Martian in his lab. 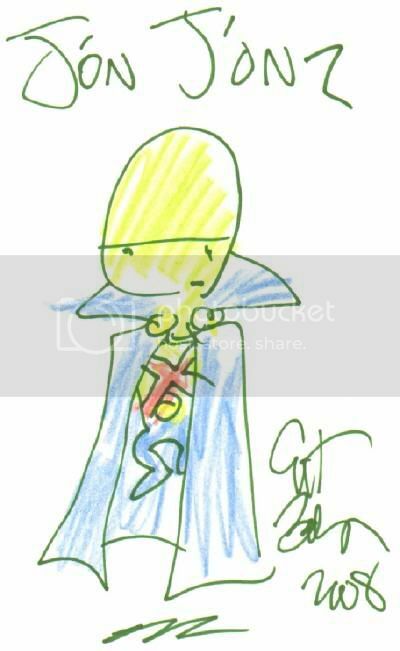 The shock gave Erdel a fatal heart attack, stranding the alien scientist J'onn J'onzz on Earth. Choosing to use his powers of shape-shifting, invisibility and mind-over-matter for the benefit of his new home planet, the alien assumes the role of police detective John Jones, secretly the Manhunter from Mars. 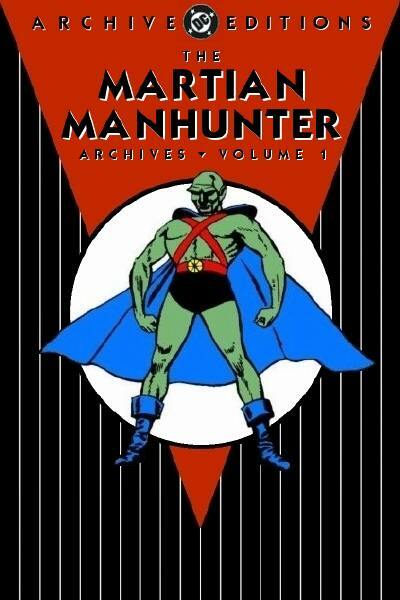 This hardcover epic reprints the original 1950s tales that first introduced the Martian Manhunter, as well as a rare Batman story featuring the forgotten first Lawman of Mars, Roh Kar. Relive the sleuth from outer space's earliest adventures, and meet the Getaway King, Captain Harding, Diane Meade, and Tor the robot criminal from Mars. 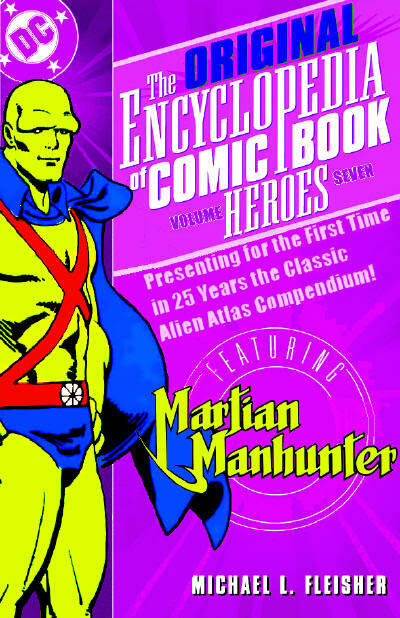 Over three dozen exciting Alien Atlas adventures are included in this impressive volume, which reprints the Martian Manhunter stories from DETECTIVE COMICS #225-260 & BATMAN #78, with an introduction by Wade Greenberg! Inspired by "my finally acquiring Kabel, the Archives cover font," Tom Hartley crafted his take on what a Manhunter from Mars DC Archive Edition might have looked like. Two career high points, the late '90s Morrison JLA years and the mid-'00s Justice League animated series, passed without such a beast coming into existence. With DC increasingly sidestepping Archive Editions for other formats, and especially with all of J'onn J'onzz's Silver Age solo stories being collected cheaply in two Showcase volumes, I doubt this will ever approach reality. Had it been published, I suspect it would have collected the John Jones stories in Detective Comics #225-261, and featured a Michael Uslan introduction that would have compared Manhunter unfavorably to Superman and Batman. Even before the Archives program was downsized, this was a longshot. But if such a thing were published, it would include the 1953 "Manhunter from Mars" story from Batman #78, just like the first Showcase Presents volume. That and the John Jones stories from Detective 225-260 would be 226 pages, total. Add the usual 8 pages of front matter (title page, indicia, 2-page table of contents, 4-page foreword), a page or two of creators' bios at the end, and some blank pages, and you have 240 pages. Here's a cute one from the creator behind Tiny Titans! Okay, I'm behind schedule on every blog I run, I'm heavily involved with a special project next week, my sister's family starts a week long visit from out of state this weekend, I had food poisoning and the dog ate my homework. Suffice to say, I'm frayed and winging it for dear life, so I appreciate when you folks come alone and provide me with material in a pinch. For instance, Shag extended an invitation to use pictures from his DC jigsaw puzzles, and I got two posts out of that sweet deal. At the end of one, I mentioned an Aquaman-themed jigsaw puzzle I'd stumbled across while filling out my portion of the Shag posts in the wee hours of the morning before work. 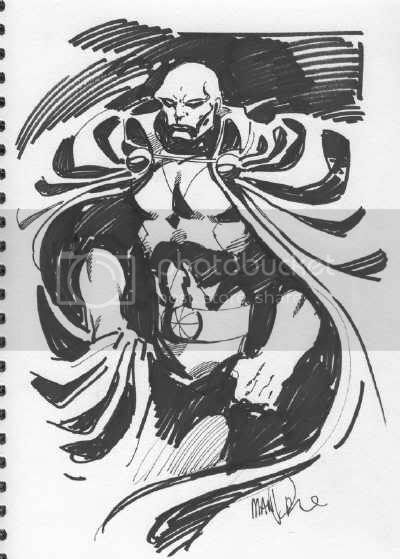 Tom Hartley, responsible for a pair of popular speculative covers for Showcase Presents: Martian Manhunter Vol. 3 TP, seen here and here, continued exploring to uncover a third jigsaw puzzle for J'Onn J'Onzz! The tin was produced by Fusion Toys, presumably within the last decade. MSRP is $10.99, though you can find it cheaper, and measures 8 1/4" x 8 1/4" x 3". Here, our hero is joined by Batman, and once again, Dr. Fate. It's really curious how often the Manhunter from Mars gets wrapped up with Kent Nelson. From multiple Earths analogs to co-founding the Post-Legends Justice League to sharing a helm of power to pairing off in random pin-ups. They were even part of the same Super Powers Collection wave, which involved appearances in one another's mini-comics and even standing beside one another in an animated television commercial. If I didn't know back, I'd get all Brokeback about this! Anyway, thanks to both Shag and Tom for the great and timely offerings! Courtousy of The Irredeemable Shag's Once Upon A Geek comes a pair of jigsaw puzzles for today, both still vacuum sealed in their original packaging from the Warner Brothers Store. This one is magic hero themed, featuring merchandising oddities like the Spectre and Dr. Fate, that latter not having seen much play since his '85 Super Powers Collection figure. Supergirl, Hawkman and Captain Marvel are there, but curiously, Zatanna is not. 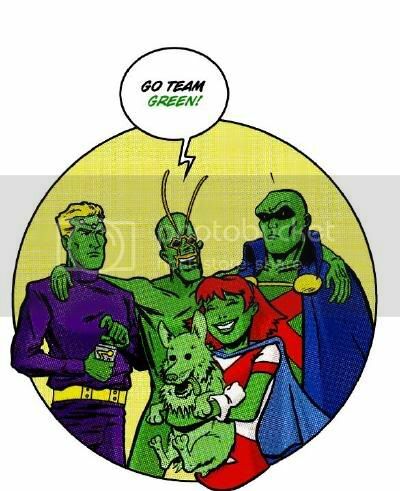 Finally, there's the Morrison/Porter JLA, though as drawn by the unofficial '90s Martian Manhunter merch artist Eduardo Barreto, you can hardly tell. Well, outside Kyle Rayner's crab mask, Aquaman's hook hand, and the always regrettable inclusion of Plastic Man. Shag says the puzzle was foil stamped, but do I detect some embossing here, or as that just the box? To read more and enlarged art details, click here. 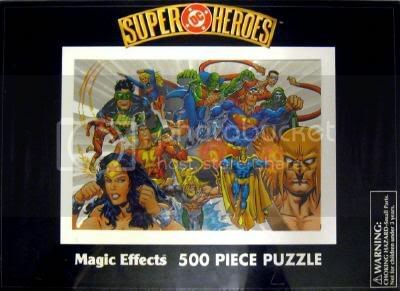 While you're bouncing around, could somebody ask Rob Kelly if he's seen the Justice League of America Dolphins 500-piece Puzzle Tin. I stumbled upon it while doing research, and isn't it the most curious thing for The Aquaman Shrine? Courtousy of The Irredeemable Shag's Once Upon A Geek comes a pair of jigsaw puzzles for today, both still vacuum sealed in their original packaging. These were released (exclusively?) through Warner Brothers Stores at a sale price of about $12.00. I tend to agree with Shag that the art was by Dan Jurgens, but there's something decidedly off about the look. Maybe this was the product of a jam inking session, as Lobo looks a bit like Val Semeiks, Batman has traces of Graham Nolan, and so on. To read more about this very of its time piece of merchandise, as well as to drink in the enlarged art details, click here. P.S. I miss the Jim Balent Sentinel costume and the Legion from this period. Not much else, though... especially Atom with a vest! Comic Book Movie Casts the ENTIRE 108 Members of the Justice League! There's a fan site called Comic Book Movie that specializes in news about just that. 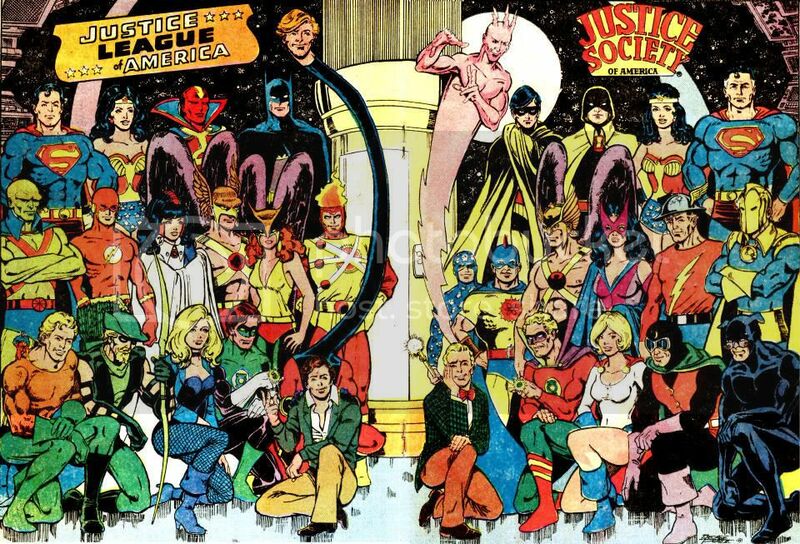 One of their commentators who goes by the name THEHAWK recently decided he would fan cast the entire Justice League, including the Detroit era, JLI, JLTF, Elite, Antarctica-- everyone. No small task, and many of his choices are utterly insane, but some are pretty observant. Besides, even I never gave a second's thought to who would play, say for instance, Maya. You can see the entire list here, but I figured I'd highlight some specific examples for this blog. My main issue with most of these choices is that the actors are just too danged old. Gypsy, Zee, Vibe and Steel into their thirties is asking a bit much. 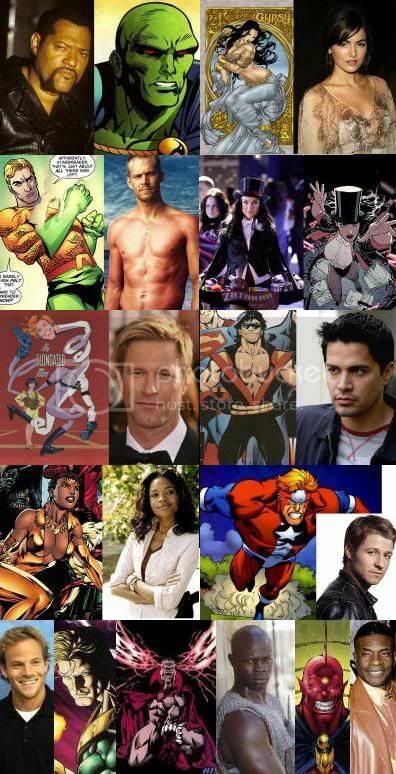 Fishburne's already "played" Silver Surfer, and turns up as J'Onn on too many of these lists. 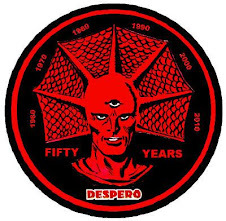 I couldn't complain about Keith David as Despero, but that guy is the Sam Jackson of voice work-- he does everybody. I do like Hounsou a lot as Bloodwynd, though. The 1980s adventures of the Justice League continue! This new volume, now in trade paperback, collects JUSTICE LEAGUE INTERNATIONAL #23-25 and JUSTICE LEAGUE AMERICA #26-30. This one includes a great Invasion: Aftermath story and the recruitment drive for the League's European branch, both highlighting J'Onn J'Onzz. The other issues fall into that fallow period between Kevin Maguire and Adam Hughes on art, usually sporting work by Ty Templeton. The stories were pretty blah, focusing on a semi-serious Blue Beetle arc. Summer’s hottest event explodes in this critical issue! Hold on to your power rings, because the secrets behind the Blackest Night finally stand revealed! While Earth is evacuated, Hal Jordan embarks on a brave journey to the darkest depths to uncover the truth behind the Black Lanterns! You won’t believe what he uncovers! Continuing the best-selling epic from superstars Geoff Johns and Ivan Reis! Not sure if Black Lantern Martian Manhunter is here, but the odds seem decent, and the book has been pretty good so far. It's finally over. Anyone willing to recommend the trade paperback collection to me? And in the Ravager second feature, Rose uncovers a horrific black market. And she deals with it the only way she knows how: with blood. With their backs against the walls of a battered Titans Tower, the few remaining Titans face their dead former teammates who have now become Black Lanterns! Meanwhile, one Titan discovers a secret weapon...but at what price? Don’t miss this finale from writer J.T. Krul (JSA CLASSIFIED, Fathom) and superstar artist Ed Benes (JUSTICE LEAGUE OF AMERICA)! Retailers please note: This issue will ship with two covers. For every 25 copies of the Standard Edition (with a cover by Ed Benes & Rob Hunter), retailers may order one copy of the Variant Edition (with a cover by George Pérez). Please see the Previews Order Form for more information. She's still on the team, right? I can't keep up with these constant line-up changes. Frank), retailers may order one copy of the Variant Edition (with a cover by Joe Kubert). Please see the Previews Order Form for more information. Just a cameo, but foreshadowing a major appearance by a revamped Jemm next month. 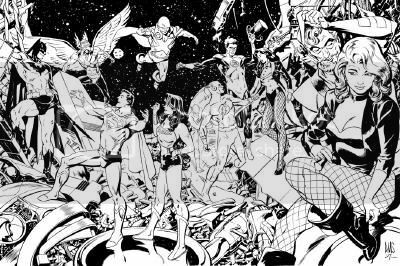 Here's a keen commission by Dennis Culver featuring several of my favorite DC characters! Brainiac 5, Ambush Bug, Martian Manhunter, Changeling/Beast Boy, and Miss Martian are on display, and can be enlarged here. An absolutely stunning piece by the famed artist of Uncanny X-Men and The Golden Age. You absolutely must enlarge this! Batman, Superman and Wonder Woman cheerfully discussing the grand spectacle! Zatanna thanked by Green Lantern Hal Jordan and the Barry Allen Flash after risking all! The Atom (Ray Palmer) blocking Ollie "Green Arrow" Queen's attempt to lay the mac on Black Canary. Hawkman and J'Onn J'Onzz coming in from off stage-- were they late to the party, briefly taken out of play, or too uptight to presume the battle was entirely done? My guess: Searching for Aquaman, whose absence is conspicuous! "Many light years from Earth is Mars II... a tiny world colonized by the survivors of the war that made the original Mars uninhabitable." 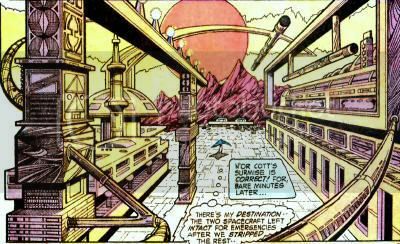 Upon this adoptive world, the surviving Martians cannibalized whatever technology they could to construct the Spacefort, their colony. Similarly, most of the colony's advanced weapons were converted to tools. Therefore, few projectile weapons were available, and police were armed with swords. Initially, only two small spacecraft were left intact for emergency purposes, though the Martians eventually reconstructed an attack fleet through unknown means. J'onn J'onzz was twice chosen as leader of the Martians at the Spacefort. 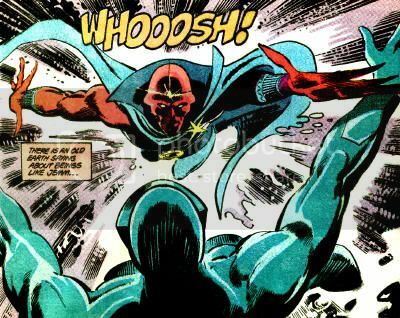 The Keeper of the Sacred Martian Symbols, Re's Eda, was about to hand J'onzz the Scepter of State when Eda appeared to be assassinated. Instead, Re's Eda led every Martian man, woman and child out of the Spacefort in a march through the Primitive Zone toward the city of Baltaz. This force cleaned out the weapon armory and all military supplies at the Spacefort, leaving it deserted. Presumably, but not definitely, the Martians returned to the Spacefort after having been routed at Baltaz. So you're asking yourself, what would I have in common with a muscle-bound simpleton like the Hulk? Well you see, this big gray lug first popped up back in 1962, but he didn't exactly make a splash. Been there. By then I'm sure folks had their fill of Frankenstein types. I went with "alien visitor," which wasn't so fresh by '55. Klaatu barada nikto, and all that. But y'know, in the second issue of Hulk's book, he turned from gray to green. Even though his series was canceled with issue six, that emerald hue I know so well has that certain something that can nab a guy steady work as a back-up. Heck, he actually split Tales to Astonish with Sub-Mariner, the way I timeshared House of Mystery with good ol' Robby Reed. Eventually, Hulk took over the entire magazine. My house became infested with anthology horror, but them's the breaks. 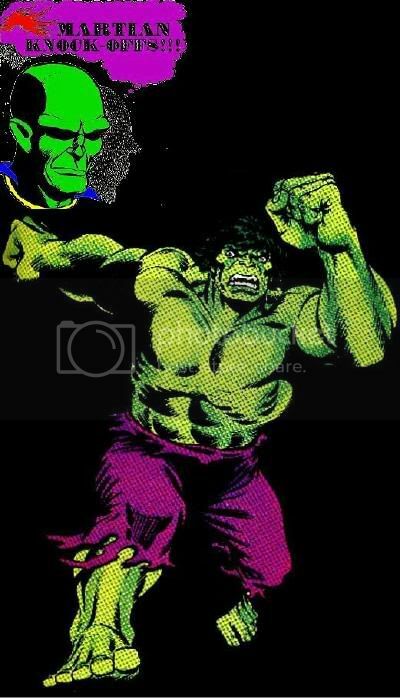 Hulk become a well-known but only partially respected fixture of the Marvel Universe, his title perpetually on the verge of cancellation for twenty years. I know exactly what that's-- waitaminute! That could've been me! Hulk steal Manhunter dream life! Martian smash! My main problem with the Hulk though is that nine times out of ten, a kid points to one of my action figures, and goes "look, it's the Hulk!" Sure I've bulked up over the years, and the Hulk's had a pronounced brow at times, but you'd think my complete and total lack of hair might tweak the little buggers' puny ape brains something was amiss! Complimentary colors aside, this is why I never, ever wear purple. Hey-- kid... cape. Word to your mother. Your young are morons, human. I've never understood why The Skrull race wasn't the one destroyed in Operation:Galactic Storm, instead of the Kree. I think Marvel just wanted to spite me. I mean, sure, being a green-skinned shapeshifting alien comic book race doesn't make them Martians. We could have just been "inspired" by the same cornball movies and bad pulps. I didn't really get ticked until I laid eyes on their Super-Skrull. Okay, right off the bat, the guy fights what was the premier Marvel super team at the time of his creation. The Fantastic Four would never even have existed if Marty Goodman hadn't had his fill of my pal Jack Liebowitz's bragging about the sales of the new Justice League of America at their golf game. The cover of FF #1 even resembles the JLofA's first appearance in Brave and the Bold #28. So this guy has all the FF's powers (like our Amazo, the one android JLA,) and that includes fire. So he's superstrong (like me,) can turn invisible (like me,) flies (like me,) and he produces my greatest weakness to boot! Foul play! 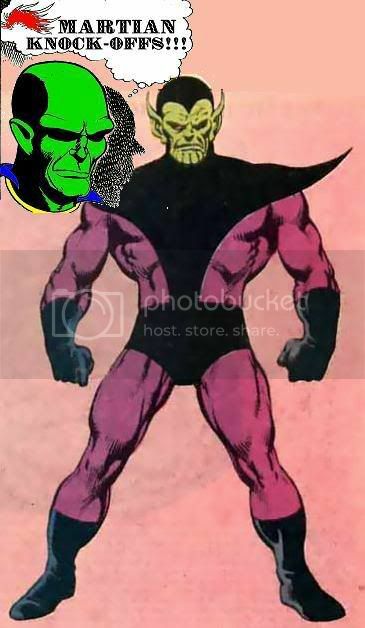 Luckily, Super-Skrull is even less liked and respected than I am. I think he may be dead right now too. Eat it, hypercleftchin! Based on the Alex Ross "original seven" painting of the 7 original Justice League members, I comissioned Tex do his rendition. What is also incredible is this piece is 24" X 30" and on MASONITE!!! it is now published in Tex: The art of Mark Texeira. 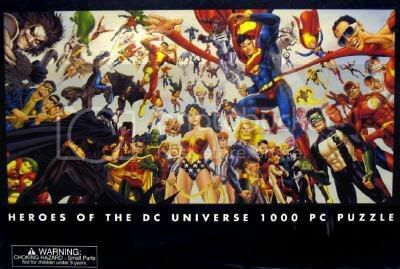 Dare to compare: 1992 Alex Ross "DC Comics Painted 1". 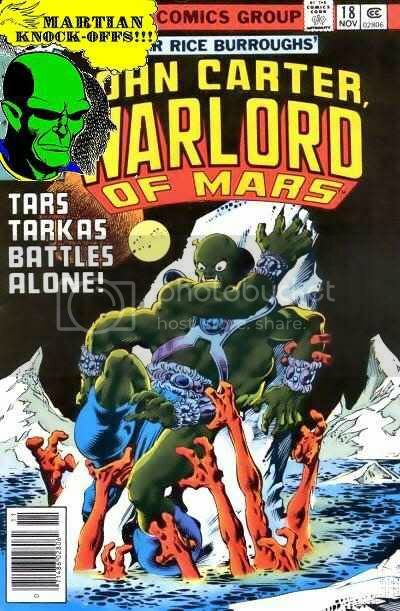 Tars Tarkas was the leader of the largest army of four-armed, antennae-bearing green warriors on the planet Mars, though they called it Barsoom... or at least that's how it's written in Edgar Rice Burroughs' John Carter: Warlord of Mars novel series. Burroughs is best remembered as the creator of Tarzan, but this series is much beloved, and still in print today. Transported from Earth to Mars during the U.S. Civil War, Carter quickly found love and action on his new home world. He was soon captured by a group of Martian warriors, until his ability to jump great distances on Mars' surface made him a form of entertainment among the native people. 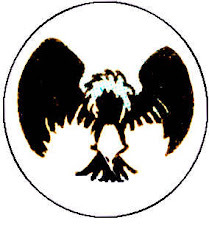 Carter was placed under the watch of the great fighter and leader Tars Tarkas. Over time, John Carter also became a warlord, and a trusted friend to Tars. Tarkas himself eventually rose to the rank of emperor of his world. Tars, as noted, had four arms and two legs. His eyes rested on inch tall stalks that could look in any direction, separate or together, with bright red irises. He was hairless, with olive green skin. He had bright white teeth, with tusks that curved up toward his eyes. He stood fifteen feet tall, and would weigh about four hundred pounds on Earth. Because of Mars' lighter gravity, Martian bodies were much weaker and more fragile than a human's. A smile on Mars was equivalent to a perfunctory handshake here. Their laughter was usually a reaction to the suffering of others, and they were known to torture captives mercilessly to provoke merriment. "Evidently devoid of all the finer sentiments of friendship, love, or affection, [the Martian] people fairly worship physical prowess and bravery, and nothing is too good for the object of their adoration as long as he maintains his position by repeated examples of his skill, strength, and courage." 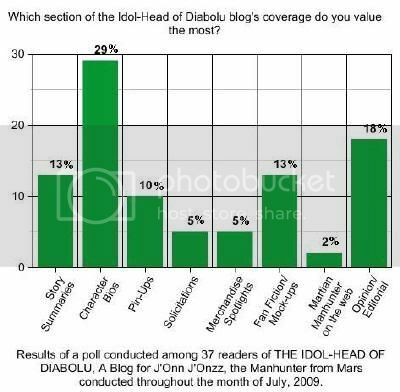 -from "A Princess of Mars"
Which section of the Idol-Head of Diabolu blog's coverage do you value the most? Perhaps I should have run this poll as multiple answer, because some of the results really surprised me, and I'm not entirely sure what to make of it. I expected character biographies to do well, and at over twice the votes of any other option save one, I need to make them more of a priority. I added Opinion/Editorial at the last minute to fill up space, and it took the second spot, much to my shock. I'd previously assumed my blatherings were at best tolerated while folks waited for informational posts. I could probably stand to do more to engage readers in discussion, since comments on a given post never break double digits, and often even single digits. I'd been using pin-ups as filler when I'm too tired/disinterested/backed-up to offer a substantial post, but given their poor showing, I imagine I'll just offer up Op/Ed instead. Besides, I really need to get all those random pictures organized and under a button. I'd always considered story summaries the real meat of the site, so of course they take up the most time and energy. They tied for third with fan fiction/mock-ups, which I again thought were at best humored by readers who hardly ever comment on my fake issues of Manhunter from Mars, of which I haven't made an offering since March. There isn't even a button! Then again, my April Fool's Bloodwynd mini-series announcement! consistently brings readers to this page via Google searches, so maybe my head was just in the sand. Obviously, I'm happy to post your own gags, like The Irredeemable Shag'sJustice League #1 Cover Figural Recreation and Tom Hartley's Showcase Presents: Vol. 3 TP, so keep 'em coming! Solicitations and merchandise spotlights really underperformed. I take great pride in delivering rarities like the 1985 Grenadier Models Pewter Miniature and the 1969 Fleer Martian Manhunter Temporary Tattoo, but maybe the umpteenth t-shirt appearance isn't for everybody. Martian Manhunter on the web is pretty vague, but it will inspire future Op/Ed, so there's that. 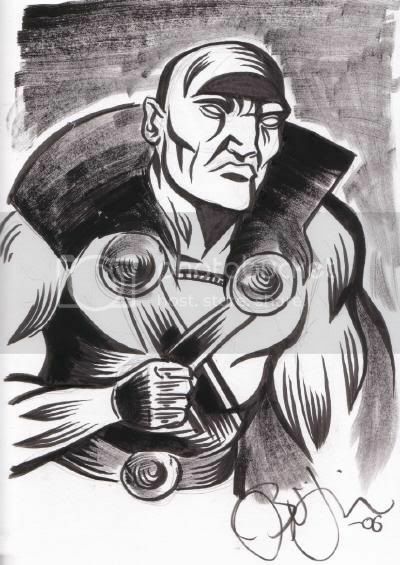 Results of a poll conducted among 37 readers of THE IDOL-HEAD OF DIABOLU, A Blog for J'Onn J'Onzz, the Manhunter from Mars conducted throughout the month of July, 2009. Here's another piece by Martian Manhunter and Jemm artist Tom Mandrake, which may seem suspiciously familiar. 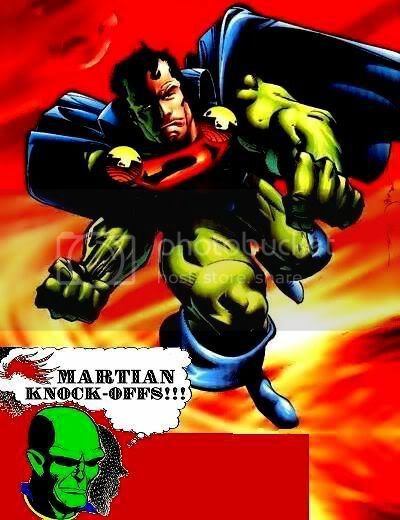 The "Superman: Two Worlds" panel at Comic Con International 2009 in San Diego touched upon both the Martian Manhunter and especially Jemm, Son of Saturn. This fact has mostly been overlooked in print, but can be heard on the DC Comics podcast page. Seeing as it's our specialty, I will now transcribe the relevant passages. I was like, you know, flip-- looking around at the various DC things, and I was like "Wow, there's another whole race in our solar system we don't think about." So, ah, at the end of ah, issue eight, as the cliffhanger; we're revealing our stories here; but Jemm, Son of Saturn is going to appear. He's now the ruler of an entire race of aliens that-- whose powers are akin to the Martian Manhunter's. 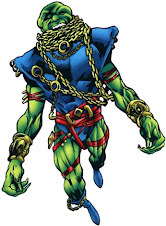 And, someone said to me once, "Well, the problem with Jemm is he's sort of like the weak version of Ma-- J'Onn J'Onzz," and we're gonna turn him into, basically, the alien version of Namor. And he's gonna turn up, and say "Look, you can't start moving moons around in the solar system, you know. This came close to Saturn... doesn't directly effect our planet. If you do anything that endangers us, we're going to have to come down on you like you wouldn't believe." So, that cover by Gary Frank is superb... Jemm, Son of Saturn just looks cool. You know what I realize what it reminds me of? ...It's one of the Frazetta Conan pieces, and it's very evocative. When you see it, everybody's "What is he on about?" When you see it, it'll make sense, but it really is this sort of classic. He's taken this sort of fantasy-- high fantasy-- barbarian trope, and turned it, sort of on its side and made this great science fiction trope, and it's-- it's beautiful. It's a gorgeous cover. Courtesy of Justice Customs: A Virtual Customized Who's Who comes a custom Jemm styled after the Total Justice/JLA line of DC figures. From The Mego Museum, specifically the gallery of contributor Steve Moore comes this custom Jemm figure. 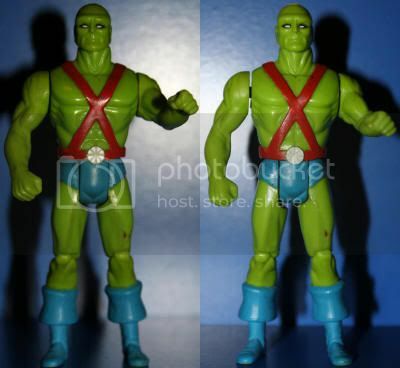 Jemm, Son of Saturn is a repainted, shrunk DC 9" figure with a kitbash of Doc Mego parts rounding out the outfit. 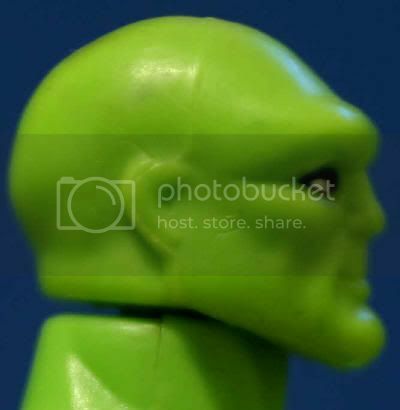 The head is obviously that of the commercially available 9" Martian Manhunter from a few years back. 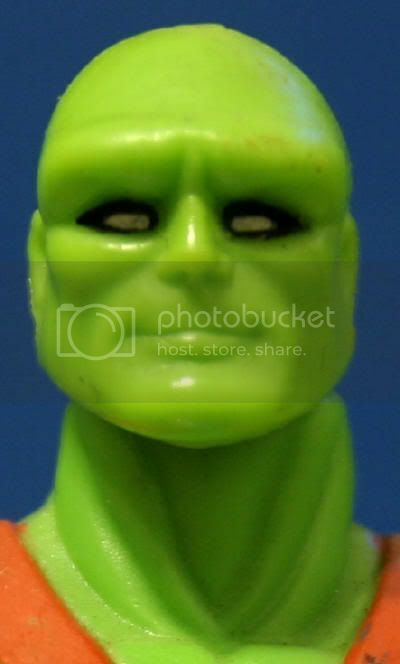 A custom of J'Onn also resides in Moore's gallery, but aside from drabbing him up to look like a Mego, it's pretty still much just the commercially available 9" Martian Manhunter. The odds do not favor Jemm ever getting the same treatment, so this custom should hopefully salve the souls of his fans. 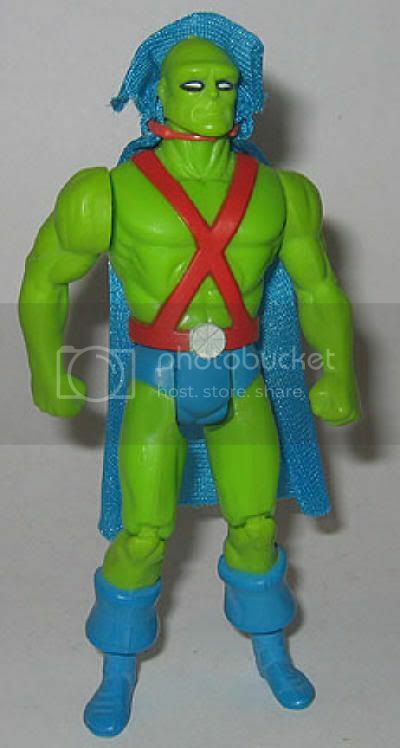 All in all, my only interest in Jemm was as a potential member of the Martian Manhunter supporting cast. I read Jemm's mini-series before his inclusion by Grant Morrison in the JLA story arc "Rock of Ages," and aside from it seeming improbable that he'd run willingly with the Injustice Gang (he didn't,) I only cared because of his role as J'Onn's opposite. Despite having read pretty near every appearance the character has made since 1984, he still feels like a cipher to me. He's basically E.T. as a super-hero. Jemm has the best intentions, is kind to children, doesn't speak much nor well, and only wants to return home in peace. Unfortunately, his gentle disposition has been perceived as too passive and weak by every writer that's handled him since creator Greg Potter, and so he's been repeatedly victimized for the sake of whatever story he appears in. It occurs to me that as much as I loved J.M. 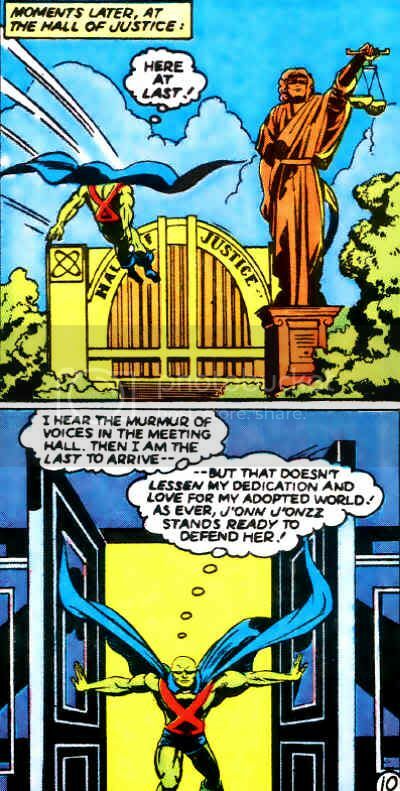 DeMatteis' take on J'Onn J'Onzz as a pacifistic humanitarian in search for his metaphysical center, that's a very difficult stance to maintain in a super-hero universe. Even I love seeing the Manhunter from Mars get really ticked off and blast people with Martian Vision. Maybe the best compromise would be to transfer the spiritual take on J'Onn to the Son of Saturn, and allow the Manhunter from Mars to earn the inherent tension his name manifests in the hearts of evildoers. That way Jemm serves a purpose beyond being a bland doormat for every malevolent alien to come down the pike.